The best vacation I've ever had was the three weeks I spent in Nepal in 1995 or '96. I was lucky. The military junta had been overthrown but the Communist insurgency hadn't begun; the Nepalese were enjoying what turned out to be an all-too-brief peace. Of those 21 days, the best of the best were the eleven I spent at a Tibetan Buddhist monastery north of Kathmandu. I've always had an intellectual interest in Buddhism, and my week and a half of direct exposure to people who were living a version of it made a lasting impression. Fifteen years later, I find that my cast of mind becomes increasingly Buddhist-like. Not to the point of converting - the faith-based assumptions of the various Buddhisms prevent that - but to the point that the four noble truths, the eight-fold path and its universal compassion and my own actions and opinions look much alike. Becoming Enlightened is not for the already practicing Buddhist or for someone seriously committed to becoming one (except to the extent that it might be useful as a quick reference to doctrine as they become more familiar with actual scripture). Though some Buddhist authorities - Nagarjuna, Shantideva, Aryadeva, among others - are quoted, there is not in-depth discussion of any of them or their doctrines. Instead, I think, His Holiness attempts to speak to the curious nonbeliever, explaining the whats and whys of Buddhism (of course, I doubt he'd be unhappy to pick up a convert along the way). Unfortunately, it makes the bulk of the book (200 pages of 250+) potentially irrelevant as it lays out the program a Buddhist should follow. Yet even if you don't accept reincarnation, the illusory nature of perception, the wisdom of extinguishing the self, or the reality of nirvana, the moral and social consequences that flow from these beliefs are worth considering - indeed, implementing, IMO. 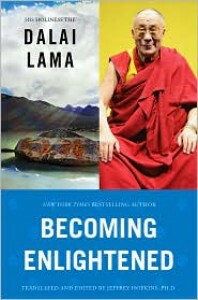 The first six chapters, then, were the most interesting to me - "A Book About Enlightenmnet", "Comparing Religions", "The Buddhist Framework", "Practicing Buddhism", "Knowing the Qualifications of a Teacher", and "Buddhism in India and Tibet". Three of the most attractive features of the religion are its rationality, its inclusiveness and its morality. An example of that rationality is His Holiness' insistence that every teaching of the Buddha as well as subsequent gurus be able to withstand analysis and reflection. In short, doubt should be the initial reaction of the student to anything they hear. If it can't endure examination, the teaching must be a "wrong view" (more on this below). Another example (and one fundamentalists of any stripe should pay attention to) is the correct interpretation of scriptures. The sacred writings of any faith are guidelines that - if truly inspired - cannot be wrong. If reason, science or experience show that a valid teaching cannot be literally true, don't deny reality or abandon scripture but understand it in another way. There's a variety of scriptures because there's a variety of human experiences and understandings. Validity depends upon implementing a scripture to good effect. If it results in continuing the cycle of suffering, then it cannot be "true" in any sense. 1. Killing: Wrong under any circumstances, though the details and intent of a death are important. The sheer scale of celebrated murder in the name of state, faith, corporation or for the convenience of low-priced hamburgers beggars the imagination on this one. 2. Stealing: As a society we idolize the accumulation of "things," which fosters covetousness (nonvirtue #8, see below). 3. Sexual misconduct: A tricky concept that the Dalai Lama avoids discussing in much detail but it includes possessive desire. 4. Lying: I don't know that we've enshrined lying as such as a virtue yet but insofar as it's necessary to justify what we have made virtuous, our society tends to practice it to perfection. 5-7. Divisive talk, harsh speech & senseless chatter: Following these injunctions would eliminate 99.9% of what we hear in the media and what passes for entertainment today. 10. Wrong views: Another nebulous concept but one that includes beliefs that promote selfishness or any of the other nonvirtues (Objectivism just went out the window). I don't want to preach, however. As the Dalai Lama argues, a rational, unbiased person who contemplates existence will come to recognize the effects of nonvirtuous conduct and belief and will cultivate their opposites.